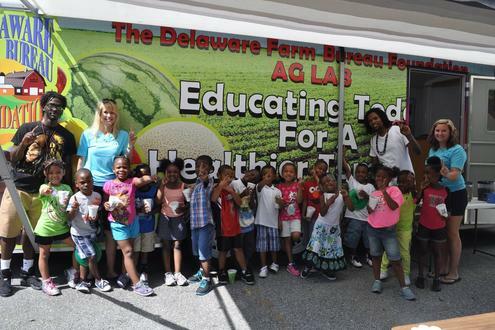 Launched in 2014 with a generous donation of the trailer from Delaware Department of Agriculture, the Ag Lab became Delaware Farm Bureau Foundation’s “mobile classroom” visiting schools and summer camps in Delaware to teach children ages 5-12 about farming, healthy eating and agriculture as a way of life. Children are taught through an interactive lesson about where their food comes from, how it’s made and what different careers are available. In 2017, Delaware Farm Bureau Foundation began a pilot program to enter elementary schools and teach fourth graders about farming and healthy eating. The pilot program became a reality in 2018 when the Ag Lab began a full time program – visiting 17 schools so far!